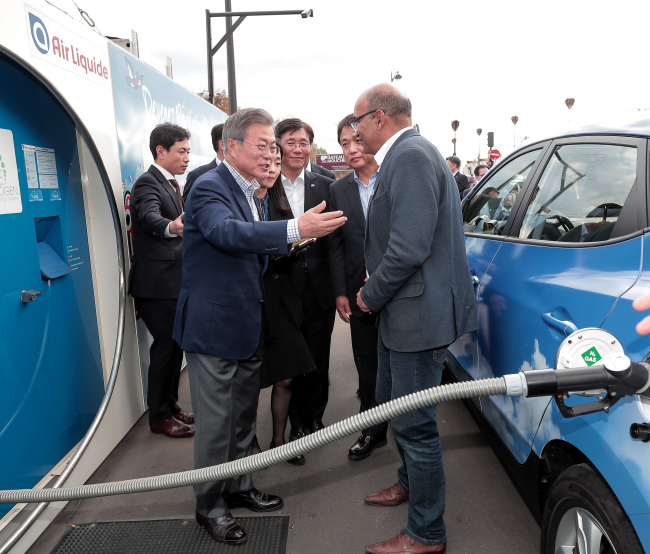 South Korean President Moon Jae-in test rode the Hyundai Motor Nexo fuel cell electric vehicle during his state visit to France on Sunday afternoon and observed the charging process of a Tucson FCEV taxi. This marked Moon’s second test ride on the Nexo SUV, following his firsthand experience of the SUV’s driverless technology in Seoul this February. South Korea’s No.1 carmaker Hyundai Motor is slated to sign a memorandum of understanding on Tuesday with French industrial gas supplier Air Liquide and ENGIE, a French electric utility company, to increase the number of hydrogen chargers and FCEVs there, according to the firm. As part of the agreement, Hyundai will supply 5,000 FCEVs in France by 2025, it added. After the test ride, Moon headed to Air Liquide’s first hydrogen charger built in Paris to attend a local taxi driver recharge his Tucson FCEV taxi. As hydrogen-powered vehicles are steadily gaining industry attention for their short charging time of about three minutes and zero emissions, the number of Tucson FCEV taxis operated by French startup STEP has risen to 62 units, compared to 5 units in 2016. “Unlike France where a hydrogen charger is located in the city, due to misconceptions about hydrogen and safety standards in Korea, hydrogen chargers are mostly installed in suburbs. There is a need for Korea to benchmark France,” said Hyundai Motor President Chung Jin-haeng. In the MOU to be signed by Hyundai, Air Liquide and ENGIE, the two French firms will be in charge of building hydrogen chargers in France, while Hyundai would supply 5,000 FCEVs including passenger and commercial vehicles by 2025, the company said. Following a 130 billion won investment deal with the Korean government to build the fourth factory for industrial gas production in Yeosu, South Jeolla Province, earlier this month, Air Liquide has also shown interest in joining a special purpose company worth 200 billion won to construct 100 hydrogen chargers across Korea by 2022. According to estimates by global consulting firm McKinsey, the number of FCEVs could reach 400 million passenger vehicles, 15 million to 20 million trucks, and 5 million buses by 2050.